As a newer model, there is no surprise that Canon EOS M3 is armed with a newer engine. While Canon EOS M still relies on an 18 MP APS-C sensor with DIGIC 5 image processor, Canon EOS M3 features a 24.2 MP APS-C sensor with DIGIC 6 image processor. As the effect, Canon EOS M3 is able to generate larger images with more sharpness and details. The colors are also slightly more accurate and solid. Both models record videos in Full HD (1080p) at a selectable frame rate of 24fps or 30fps. Each has a microphone port for high-quality audio input. While many features in Canon EOS M3 are similar to the ones in Canon EOS M, the manufacturer has done various notable improvements. The maximum ISO is still the same, 12800, but the low-light ISO is increased in order to enhance the performance in difficult lighting conditions. Canon EOS M3 also comes with more focus points spread over a wider area, making it able to capture more subtle details of the view. One issue with Canon EOS M is that it takes nearly a full second (0.74 seconds to be exact) of shutter lag time. The manufacturer has tried to solve the issue well in Canon EOS M3. Now, Canon EOS M3 only takes 0.13 seconds of shutter lag time, which is a significant and very pleasurable upgrade. This upgrade apparently plays a role in increasing the continuous shooting speed as well. 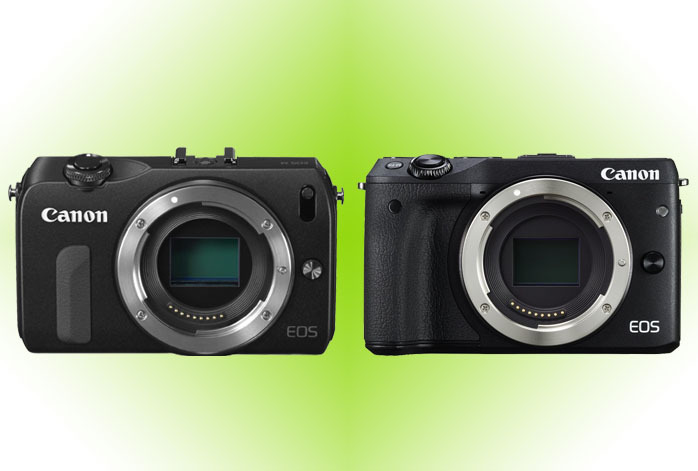 Canon EOS M3 has a slightly faster photo burst than Canon EOS M, 4.2fps compared to 4.0fps. Also, Canon EOS M3 is enriched with Wi-Fi connectivity and a built-in flash, two things that Canon EOS M lacks. The Wi-Fi connectivity is a very convenient feature that allows you to share your pictures and videos quickly and easily, while the built-in flash is a great tool that can be handy at times.